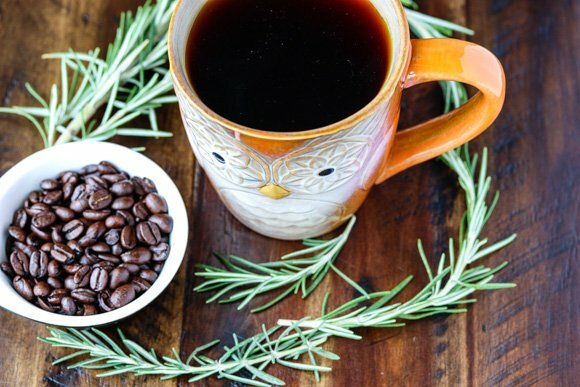 Supercharge your morning cup of coffee with the addition of fresh rosemary. This easy upgrade benefits your memory and health! 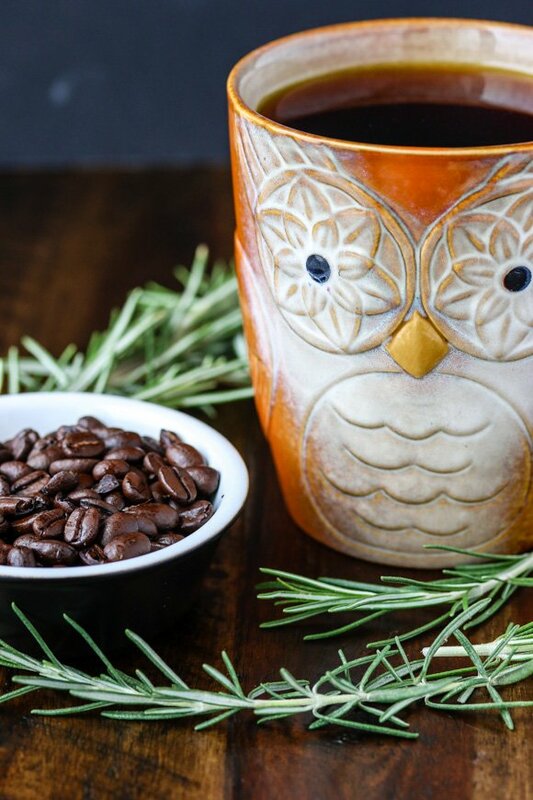 You’ll never believe how easy it is to make this rosemary coffee. You really just need a sprig of fresh rosemary that will infuse the coffee as the hot water runs over it. To start, just place a fresh sprig at the bottom of your coffee filter. Then, add your ground coffee (I recommend always using fair-trade, organic coffee beans like these that you grind yourself). This health upgrade couldn’t be easier! I’m sure you’re wondering how this Rosemary Coffee tastes? I wasn’t sure if it would be too strong even though I love the flavor and odor of rosemary. You can definitely taste it, but it’s a mild flavor, as if you added a few drops of a flavor extract. But, this flavor is 100% real and healthy and awesome. Also, in case you were wondering, it’s the antioxidant properties in the rosemary that give it its superfood status, namely, caffeic acid and rosmarinic acid. 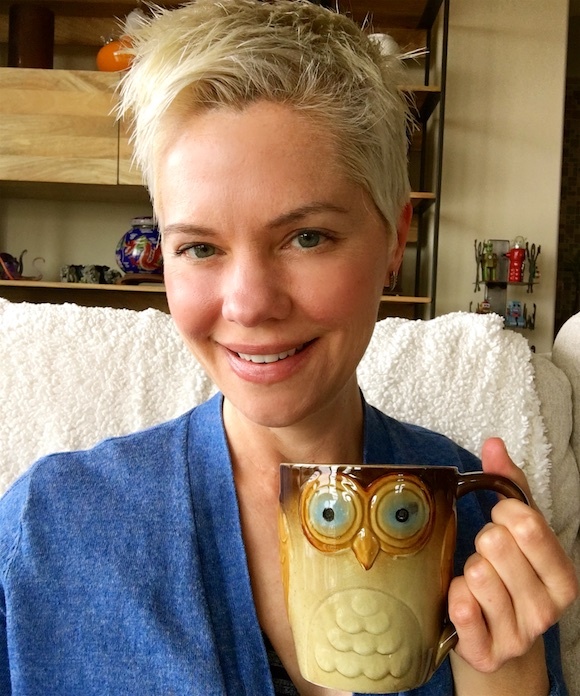 You might be wondering if coffee is a healthy beverage, especially for women with autoimmune disease? I most definitely battle with adrenal fatigue as well, not to mention living in a state of hypothyroidism now that I don’t have a thyroid. That one cup of coffee is just enough to get me going without getting jittery. I’ve done a lot of reading on adrenal fatigue and find that many practitioners recommend cutting coffee out completely. I’ve also seen recommendations to limit intake to before 9 am or to try drinking tea or matcha instead. For me, nothing matches the flavor and feeling that coffee gives me. Maybe it’s a comfort thing, but I really love the routine of relaxing with a hot mug of coffee after breakfast. I guess all of this is to say that a coffee habit isn’t a bad thing, and might actually benefit your health. I’m sure you have undergone your own health journey or are perhaps dealing with something big right now. Whatever the case, I just don’t want you to feel guilty for drinking coffee, especially if you make the effort to avoid adding sugar or processed fake stuff. You get bonus points for using organic beans and for trying this super-simple coffee upgrade using a sprig of rosemary. Rosemary is one of those herbs that has substantial research supporting its health benefits, including for Alzheimer’s and cancer prevention. And, incidentally, coffee has a ton of research supporting its health benefits, too. I’d love to know what you think of the recipe if you try it, plus any other thoughts you have about your health journey or about what I wrote. Just to wrap up what I wrote above, I’m super grateful to have been on the journey I’ve been on. It’s been tough, not gonna lie, but I’m in a place now where I’m more confident and happy and at peace than ever. I consider you as a friend if you’re reading this, even if we don’t agree 100% on everything. Also, if you are looking for innovative coffee recipes, you might like my post on how I make butter coffee fast. I include a substitution for dairy-free folks using ghee instead of butter. This recipe is keto-friendly and great for intermittent fasting. A super simple upgrade for your basic cup of black coffee. 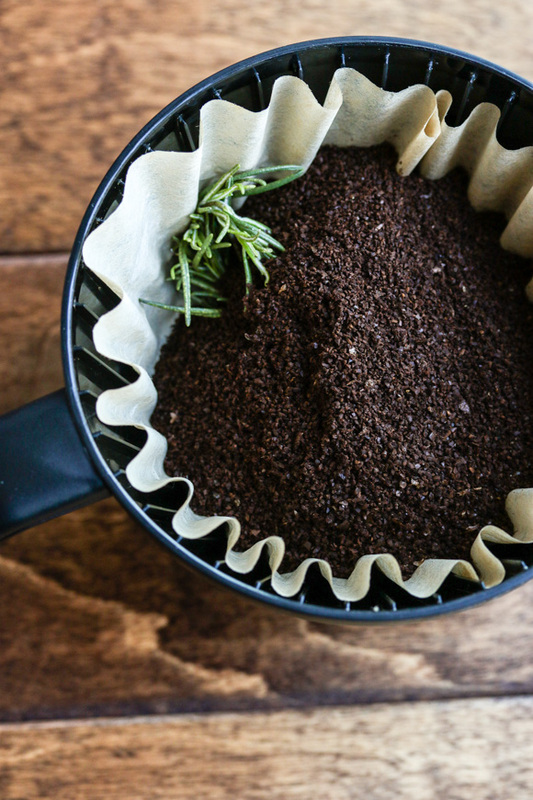 Combine ground coffee and rosemary sprig into your coffee filter basket. Prepare coffee according to your coffee maker instructions. 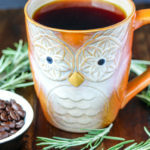 Pin this Rosemary Coffee recipe to save it! One of my favorite simple upgrades. Thanks, Dominique! I’d love to know what your hubby and mom think about the rosemary coffee. XO. Great tip to add rosemary. Looking forward to trying it out. Thanks for sharing! Firstly, I’m so sorry to hear about your health issues, and I hope you are felling better and are on the way to speedy recovery! Secondly, this is such an interesting recipe, I would never think of using rosemary in the coffee, and I’m really intrigued by it now. 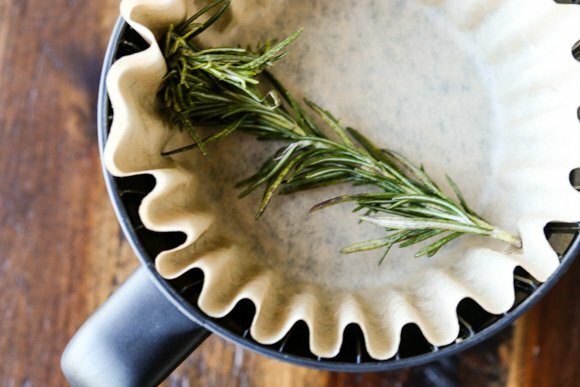 As I love both, coffee and rosemary, I will be giving this a go soon! I usually have a huge bush of rosemary growing on the yard over the summer and this is going to be part of my morning fix! Thanks! Thanks for sharing your health journey with us! I am battling a host of symptoms (colitis, tachycardia, arthritis, fluid in my ears, hair loss) that seem related. I’ve started thyroid therapy, but thus far, I’ve seen no improvement. I have for nearly 40 years (I’m 58) taken the “balanced” approach, but have been looking at paleo and keto after my physical therapist recommended them. I’m going for a month in Peru in June (2nd time), and hoping to be stronger! I too am a coffee drinker, and I’ve cut back on the caffeine substantially because of the tachycardia. I do love a cup in the morning, and I can’t wait to add a sprig of rosemary! I’ve got some planted in my garden! Thanks for sharing that, Tamara. How long have you been on thyroid hormones? Are you taking a combination of T3 and T4? I’m glad to hear your health issues are improving and am with you on the balanced approach to eating! 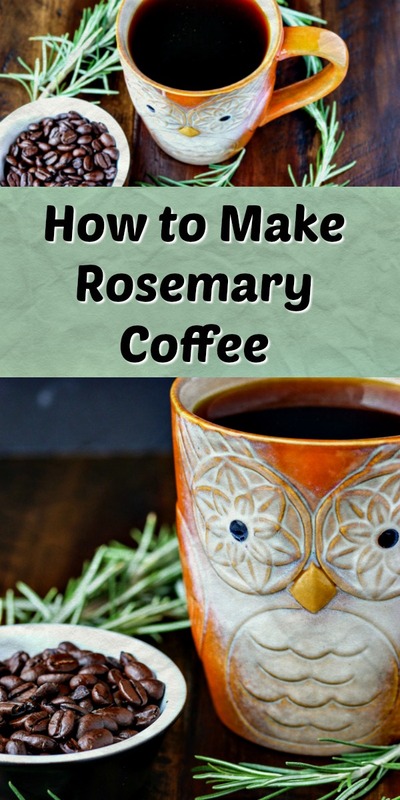 I have always liked rosemary so definitely want to try it in my coffee – maybe a rosemary latte?! Thanks, Kathryn! A rosemary latte sounds delish!!! I have never had rosemary with coffee… but that is going to change soon! I am a coffee drinker too. I did give it up for the 21 Day Elimination Diet that I did. I added it back without any ill effects. I drink mine black so maybe a sprig of rosemary would be an interesting addition. I am for anything that may aid in the prevention of cancer. Both my parents died from 2 different types. I have been reading your blog since it was Carrie On Vegan. It has been a wonderful source of information. I am vegetarian that leans toward vegan in hopes of becoming well. I have inflammation, joint pain & Hashimoto’s. The hypothyroidism has been a bear to deal with. Keeping eating as wholesome as possible has improved symptoms. I am working on healing my belly as it is said to be well, you have to heal your gut. I have leaky gut & my last testing shows zero flora. Glad to hear you’re finding your health. I am working on mine in hopes of regaining optimal health. I couldn’t love this idea more! I would never have thought of adding rosemary to coffee but now that you have put this out there, what a delightful way to start the day. Brilliant! I will definitely have to try out this rosemary coffee! I do enjoy my caffeine and I can only imagine the original flavors this coffee would produce. Well done! Sorry to hear you’ve been having such a rough go of it, health-wise. But boy am I glad you came up with this coffee upgrade! I grind beans every morning (and often in the afternoon, too! ), and I’m TOTALLY going to have to try this! I love my coffee and have enjoyed it with added cinnamon during brewing, but haven’t tried it with rosemary, yet. This sounds gorgeous and I’m going to have to give it a try! Cinnamon coffee sounds amazing, Stacey!!! I’m going to try that next! Wow thank you for the reminder, I’m here about to make my morning tea, I will definitely add some fresh rosemary leaves. I am so curious to try this! I grow rosemary and love to use it all sorts of savory applications…this is anew one for me! Thank you so much for sharing your story! I agree with you in finding the right balance in terms of diet and not necessary following one strict diet. I will definitely give this recipe a try! First of all, I am SO glad you’ve recovered from such a scary illness! Second, the way that sprig of rosemary looks nestled in those coffee beans is absolutely stunning. Third, I have never heard of this but it looks and sounds magically delicious! Awwww, thanks for the sweet words, Lindsey. I’m so grateful to have recovered from cancer, too. XOXO! Wow, what an interesting flavor combo! I’ll have to try this out, and thanks so much for sharing your inspiring story. I have rosemary growing all over my yard! I’ll add it to my crio bru. Never thought of that before! Well, adding rosemary to coffee never crossed my mind, I certainly will try that, great tip thanks! That’s a fun change up! What a cool idea and love the health benefits! I have tried so many different types of coffee, but never ever thought of adding rosemary to flavor it up. Such a wonderful idea, and i’m so looking forward to try this when I make my next cup of coffee! What a well written post!!! I am so sorry that you had to deal with thyroid cancer AND online jerks!!! I support you in however you want to eat, it’s your body- your decision. Right!? This rosemary coffee thing is super interesting. I will have to check it out. I love rosemary and am certainly addicted to coffee.. might have to try the two together. I totally would not have thought to pair rosemary with coffee! I mean I do use rosemary whenever given the chance and have 2 plants on my windowsill, as we speak. But, coffee!?? I am totally giving this a try in the morning! Beth, right?! Try it, LMK what you think!!! I’ve actually just started being able to tolerate coffee after years of reacting to it. So nice to be able to enjoy it in the morning! I never thought to put rosemary in coffee!! I too love the ritual of it, as well as the boost it gives me. I love rosemary but have never thought of it in my coffee! This is a very informative post! Thanks for that. On the health note – I do have marginal hypo thyroid and I understand the fatigue part. I hope you are doing better now. Thanks for sharing your health story, and I’m glad you have found something you are able to enjoy. I am an avid coffee drinker and will be trying some rosemary with it soon. Thank you so much for sharing your story. As a fellow Cancer survivor, I completely understand the bullying mentality of how we need to be vegan or vegetarian. 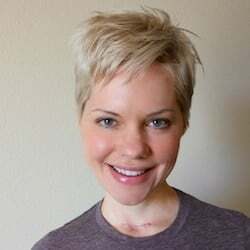 I too was a vegetarian and occasional vegan before my Cancer diagnosis but am now on paleo keto as a preventive. I can’t wait to try out your rosemary coffee ! First of all, I enjoyed reading your story. It’s nice to get to know you better. I also enjoy a cup of coffee in the morning, so it’s great to have your blessing on it. I have sometimes wondered if I should give it up, because I struggle with leaky gut issues. I’ve heard that coffee is hard on the stomach. I really like my coffee, though. So, I figure that if I do everything else right to help my gut, maybe one cup of coffee won’t hurt. I’ve been enjoying rosemary in lots of dishes lately, too, but never would have thought to put it in coffee! I’ll have to try this! What an interesting way to add flavor to coffee ! I’ll definitely try it. FUN ! Very interesting idea! I am not a coffee drinker, but I love rosemary. I imagine it smells amazing. I enjoy a morning cup of coffee, and now it’s just black. I used to load it up with sugar and milk, and now when I taste coffee like that I can’t drink it. Such a pretty photo of you!! 🙂 I love this idea, lovely!! I am just getting used to drink my coffee without milk, I tried cinnamon before and heard of nutmeg in the coffee. Will try with dried Rosemary as I killed every single plant I tried to overwinter, guess my green thumb just works outside!